January 25, 1906 – Plans are presented to the United States Secretary of War Charles Joseph Bonaparte for “the finest naval station in the world … to be erected at Lake Bluff.” [Chicago Daily Tribune, January 26, 1906] Total cost of the new base, including the land on which it will be built, is expected to be $2,500,000. Plans include an administration building, an instruction building, four dormitories, a mess hall, guardhouses, a powerhouse, detention barracks, officers’ quarters, a general storehouse, marine barracks and a hospital. A railroad spur from North Chicago will run into the base, for which the Chicago and North Western Railroad will pay $14,000. Plans are for the initial phase of construction to accommodate 1,000 recruits. Captain Albert Ross, who will oversee construction of the new naval base, says, “We depart from old notions, with the idea that in bringing the youngster in he should not be allowed to pollute the body politic, and so the first step is detention in barracks. He enters the front door, turns to his right, is taken up by the officer of the day to see that the papers given him are all right and that he has been enlisted properly. He then goes into the barber shop, where he is shaven and shorn, and from there into the disrobing room – all valuables are stored in lockers for that purpose – and he removes his clothes. He then goes into the bathroom where he is scrubbed; from there he is taken to the surgeons’ room, where he is examined, then to the paymaster’s issuing room where he is clothed in uniform. He comes in as a civilian and goes out as a naval recruit … we have five units to cover the training scheme – the detention, messing, sleeping, drilling, and instructing – each one under a different roof and surrounded by the best sanitary and fireproof building attainable. No other nation in the world has gone so far in this business.” Between 1909 and 1911, 39 buildings would be built at what is today Naval Station Great Lakes. All of them would be designed by architect Jarvis Hunt, working from his offices in Chicago’s Monadnock building. On July 3, 1911 Joseph Gregg of Terre Haute, Indiana was the first recruit to arrive at the base, officially opened two days earlier. 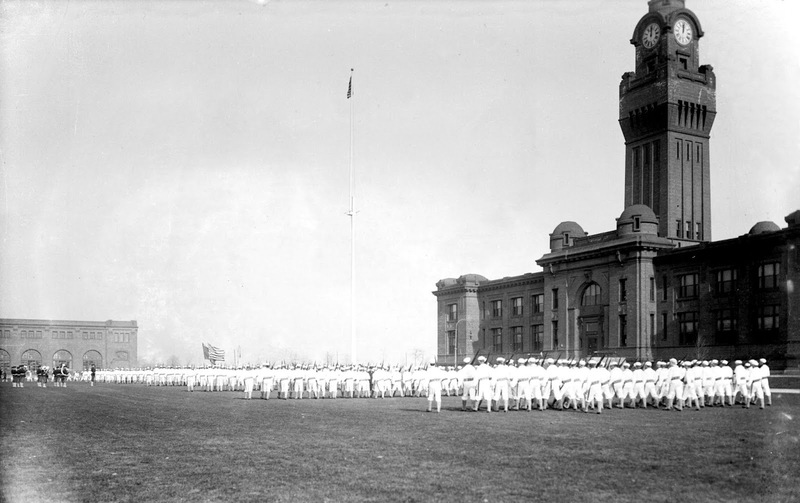 The above photo shows Building One and a parade of recruits in 1913. January 25, 1961 – The Chicago Daily Tribune reports that architect William E. Hartmann, a managing partner of Skidmore, Owings and Merrill, has delivered an address at the annual meeting of the State Street council in which he urges a “sweeping downtown building plan.” [Chicago Daily Tribune, January 25, 1961] Hartmann says, “I suggest a ‘City of Water.’ The idea of Lake Michigan, the Chicago river, and Buckingham fountain should be extended into further water exhibitions in the center area. The federal and civic center might enlarge on this theme.” He goes farther, asserting that 30 percent of the downtown area should be given over to housing. An all-weather sport stadium for 60,000 people should be located close to downtown and children should have “a Tivoli, sort of Disneyland or Freedomland, perhaps on an island in the lake.” Hartman proposes a center for the performing arts as well with a symphony hall, opera house, and theaters. The focus on art should continue with “public art as focal points – public sculpture, plazas and fountains.” Finally, the architect suggests that “the iron girdle of the Loop” be replaced with an improved transit system. With the exception of the performing arts center and the massive sports complex, it is amazing today to see how many of Hartmann’s ideas are on display in today’s Chicago – fountains, public art and sculpture, Maggie Daley and Millennium Parks, and on and on. January 25, 1955 – The Chicago Daily Tribune goes to press with the following headline on Page One: Halas to Quit as Bears Coach After ’55. 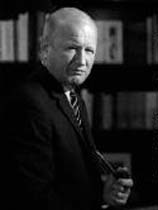 George H. Halas, the coach of the Bears for three decades, will continue as president of the club that he organized in Decatur, Illinois in 1920 and brought to Chicago the following year. Says Halas, “I decided to step down two years ago. When we began rebuilding, I made up my mind that as soon as were a strong contender again, so I could turn the club over under the most favorable circumstances, I’d move out. I figured it would be about 1956. Fortunately, everything went according to schedule. 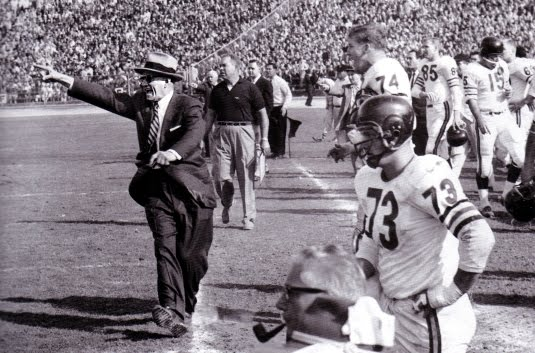 We’re contenders now, we’ll be better next fall and by 1956 I won’t have to ask anybody to take over a loser.” Halas kept his word, leaving the team in the 1956 and 1957 campaigns, but he was back again in 1958 and coached the team for another decade, winning his last championship with the club in 1963. January 25, 1925 -- The Chicago Daily Tribune reports that because the roads through Lincoln Park are the only practical way of getting from the Loop to the residential sections of the city north of North Avenue, the park, originally designed for leisurely carriage rides, is dealing with 5,000 cars per hour passing through it. That volume comes at a cost. In 1924 there are 1,420 cars damaged in accidents with 499 people injured. 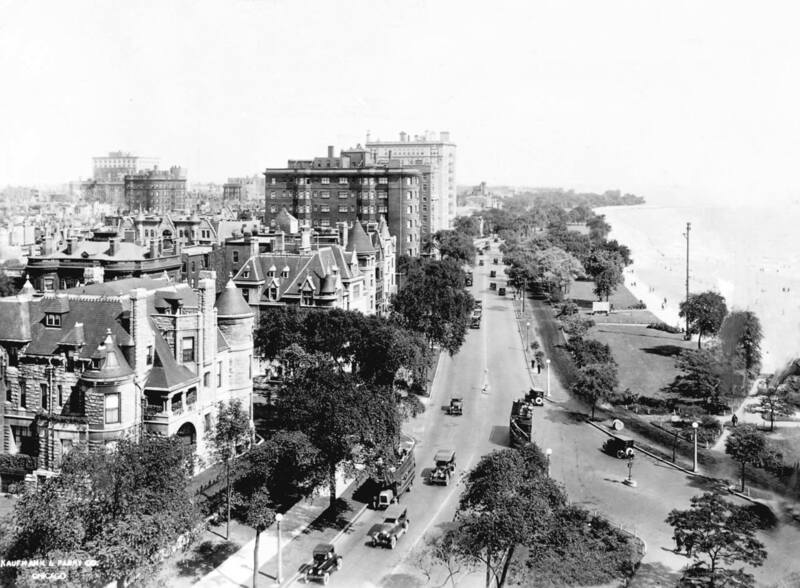 The photo above shows Lake Shore Drive in the 1920's, looking north from Oak Street. At the end of the road is Lincoln Park, where things got really congested at North Avenue.